Adam Beard is named to start. 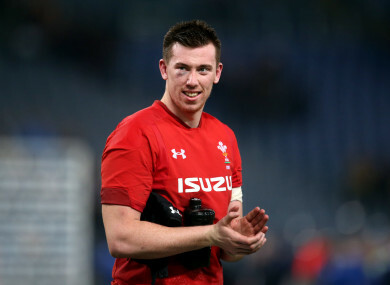 WALES HEAD COACH Warren Gatland has made one change to his starting line-up for Saturday’s Six Nations clash against Scotland at Murrayfield, bringing in Ospreys lock Adam Beard to replace Cory Hill. Hill will miss the rest of the tournament after suffering an ankle injury during Wales’s 21-13 victory over England 10 days ago. Scarlets forward Jake Ball takes Beard’s place on the bench, with Gatland announcing the team 48 hours earlier than initially planned. Wales are chasing a 13th successive victory, having not been beaten since the midway point of last season’s Six Nations, when Ireland toppled them 37-27 in Dublin. If they beat Scotland and defeat Ireland in Cardiff seven days later it would secure the title and a Grand Slam in Gatland’s final Six Nations campaign at the helm. Although Wales lost to Scotland in Edinburgh on their last visit two years ago, they had won the four previous Murrayfield encounters. And they will face a Scotland side beaten by Ireland and France in their past two Six Nations outings. Wales last won the Six Nations in 2013, a year after their most recent Grand Slam. Email “Gatland announces Wales team two days early, brings in Osprey lock Beard ”. Feedback on “Gatland announces Wales team two days early, brings in Osprey lock Beard ”.